How do you deliver awesome customer experiences (CX) in low-engagement industries? 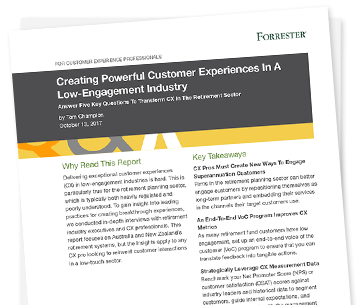 Forrester Research dove into the traditionally low-engagement industry of retirement planning to uncover key challenges and strategies that a CX professional in any low-engagement industry will find useful. Think your industry just can’t engage people? Think again. Low engagement industries require creative and innovate ways to deliver exceptional CX, but it can be done. Download the full report to learn how to successfully up your engagement and take steps to get started today.